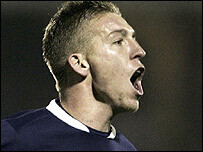 Southend pulled off a massive shock by dumping holders Manchester United out of the Carling Cup at Roots Hall. The Championship strugglers progressed to the quarter-finals thanks to a stunning first-half 30-yard free-kick from top scorer Freddy Eastwood. United responded but winger Cristiano Ronaldo was denied by two magnificent saves from Darryl Flahavan. David Jones' drive then crashed against the post before John O'Shea saw Flahavan tip over his cross-shot. After Monday's celebrations for United boss Sir Alex Ferguson's 20 years in charge at Old Trafford, the Scot was brought crashing back down to earth. Ferguson made nine changes but still fielded 10 internationals in an attempt to prevent the Premiership leaders from slipping up, with 11,532 cramming into Roots Hall to see a potential upset. Ronaldo and Wayne Rooney were included and the England striker went close twice from the edge of the area as he started in lively fashion. Both chances forced saves from Flahavan, the second after a magical piece of skill bemused two defenders and created a yard of space. But Southend were not being over-run and just before the half-hour mark they took the lead in sensational circumstances. Jones fouled Jamal Campbell-Ryce 30 yards out and Eastwood stepped up to curl a wonderful free-kick around the wall and into the top corner past Tomasz Kuszczak. The screamer sparked wild scenes of jubilation, but United nearly levelled immediately as Jones' fierce left-foot drive slammed against the inside of the post. United poured forward and Ronaldo hit a cracker from 30 yards that Flahavan somehow tipped one-handed over the crossbar, a magnificent save from the 27-year-old. He needed to be alert straight after the break as well as Ronaldo tried his luck from 25 yards, this time Flahavan parrying away a shot straight down his throat. It was becoming something of a duel and Ronaldo was denied again on the hour mark, a 25-yard free-kick forcing another remarkable save as the ball screamed towards the top corner. Soon after it was O'Shea's turn, his cross-shot from the right hurriedly turned over by Flahavan as it looped goalwards. Gabriel Heinze then got in on the act, the Argentine's sweet left-foot drive flying inches wide of Flahavan's left-hand post with the keeper - for once - beaten. Eastwood remained a menace as Southend threatened on the break, but his wonder goal proved enough to send Southend into the last eight and end United's hold on the trophy. Southend: Flahavan, Hunt (Francis 14), Prior, Sodje, Hammell, Campbell-Ryce, Clarke, Maher, Gower, Eastwood, Hooper (Lawson 67). Subs Not Used: Wilson, Cole, Moussa. Man Utd: Kuszczak, O'Shea (Lee 75), Brown, Silvestre, Heinze, Ronaldo, David Jones (Shawcross 90), Fletcher, Richardson, Smith (Evra 60), Rooney. Subs Not Used: Heaton, Rose.